DANA POINT — A waterfront building that in the past was home to several popular restaurants has been remodeled to create a new headquarters for Pacific Asian Enterprises, builder of Nordhavn Yachts. “Everything we have envisioned has come true,” said Dan Streech, president of Pacific Asian Enterprises. 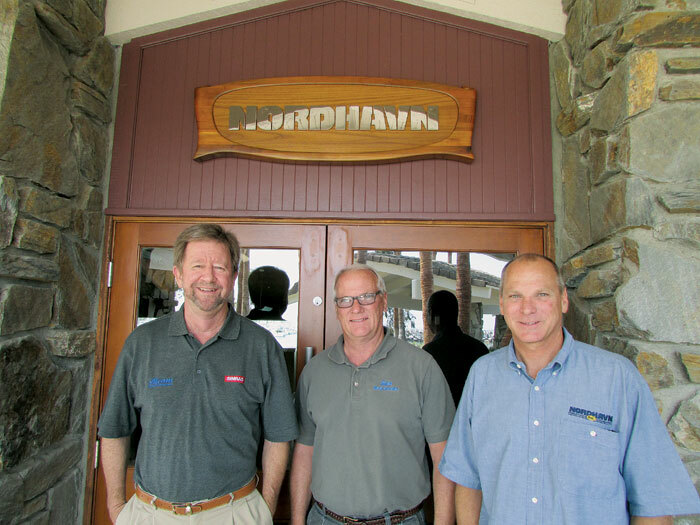 For nearly 40 years, Streech, along with the business’ founders and co-owners, Jim and Jeff Leishman, have conducted business out of four offices situated on Dana Point Harbor. On Jan. 1, the owners and their 70-member staff were united, moving into one central building in the harbor. The 10,000-square-foot building provides plenty of room for the company’s current staff and has room for potential growth, he added. Incorporated in 1979, the yacht designers and builders are long-standing tenants in the harbor. Pacific Asian Enterprises (PAE) originally opened its office doors in Dana Point Harbor in 1974. Both Streech and Jim Leishman worked at Kettenburg Yachts before the company closed its doors in 1973. The duo opened a small yacht brokerage in Dana Point with their then-business partner Joe Meglen, operating out of one office. In 1988, the first Nordhavn yacht was introduced, filling a niche market for offshore passage-makers. As the boat line’s popularity increased, so did the company’s staff and the overall business. PAE has expanded with offices in Seattle and Stuart, Fla. Suddenly, one office was no longer enough. “We grew and expanded, and we did as much as we could (in the allotted office space),” Streech said. However, the availability of a large building on the water in Dana Point Harbor seemed to be the answer the PAE team was looking for. Originally housing a bar, the building changed hands throughout the years, serving as restaurants — Delaney’s, Castaways and the Beach House. When the Beach House restaurant closed its doors nearly two years ago, PAE’s leadership team began to envision converting the building into the company’s center of operations. PAE entered a bid when the county issued a Request for Proposals. The bid was accepted, and the Orange County Board of Supervisors issued the company a 30-year lease. The building required an extensive overhaul before the company could officially move into the facility. After being cleared to begin construction, work began in Summer 2012 on the 1970-constructed building. There was major work to be done. Aside from replacing underground sewage and water utilities, the interior of the structure was gutted — removing freezers, air conditioners, heating systems, lighting and walls. Approximately $1 million was spent on the project, which included bringing the 40-year-old building to modern-day code. “It was in rough shape,” he said. Nautical décor, booths and other restaurant remnants were removed to make space for office equipment and desks, and to provide room for sales, engineering, boat design and other departments within the company. PAE retained the fireplace, open appearance and a long-standing bar. PAE staff members relied on the fireplace to provide heat during the winter months, and the bar remains as a nostalgic piece. “Some of the boats were conceived here, when this place was a restaurant,” Streech said. The bar area and an outside patio are ideal for hosting Nordhavn customers, who sometimes fly in from other countries or drop by from nearby harbors. Visitors can also watch the inner workings of the company, as project managers, designers and parts and services are now in one facility. Nordhavn yachts are constructed at facilities in China and Taiwan, and are delivered to customers around the world, with the Dana Point office serving as the company’s headquarters. While the seakindly cruisers are available in a variety of size ranges and configurations to suit a wide range of buyers, the company’s highest-priced yacht to date was $20 million. Nordhavn yacht aficionados are advised to watch the company’s Web page for upcoming events and new boat models. A 120-footer is currently being completed in China and will be delivered to Canada in July. A new 49-foot boat will also be introduced this year. The company plans to hold an open house at the new facility on Oct. 5. “This is the perfect venue,” Streech said.